Spring Break week has been very busy. I have fished every day with including a couple of 2 trip days. As the water is starting to warm the fishing is really heating up. Almost every ledge off the Red River channel is holding fish. The schools in these locations are so good I have started dusted the anchor off and started anchoring down in 40-55 feet of water and catching good messes of stripers. Of course this time of year, some days are better than others, but when the stripers are on the feed they are in a frenzy. The off days you may not see quite this frenzied action, but they are definitely better than the past few weeks. The afternoon trips I had this past week were really good. The seagulls were working schools of stripers so we switched to one ounce glow sassy shads and wore them out. If you get in a spot where the "dinks", stripers just under the size limit, find you, pull anchor and find another spot. If you stay with them you will spend all your fishing time throwing them back. Think about taking your children fishing. Get them involved in a true family fun experience. 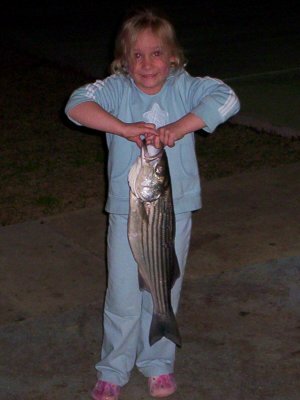 Remember that age is not a criteria for having fun catching good looking Lake Texoma stripers.